Rocker Slash has said that he was too intimidated to ask Radiohead’s Thom Yorke to appear on his new solo album. Speaking to The Sun, the former Guns N’ Roses guitarist revealed that he planned to ask Yorke to provide vocals for a track but was too nervous to call the singer. 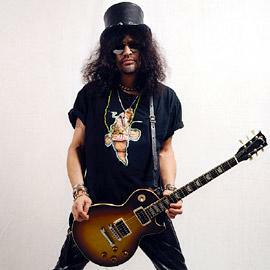 “I wanted Thom Yorke to do ‘Saint is a Sinner Too’, but I didn’t have the balls to call him,” Slash said. The song was recorded instead with singer Rocco DeLuca, who fronts rock band Rocco DeLuca and the Burden. Dave Grohl, Motorhead’s Lemmy, Iggy Pop, Kid Rock, Fergie and Ozzy Osbourne all appear on the musician’s upcoming self-titled record. Previous post: Win all of Radiohead’s EPs!